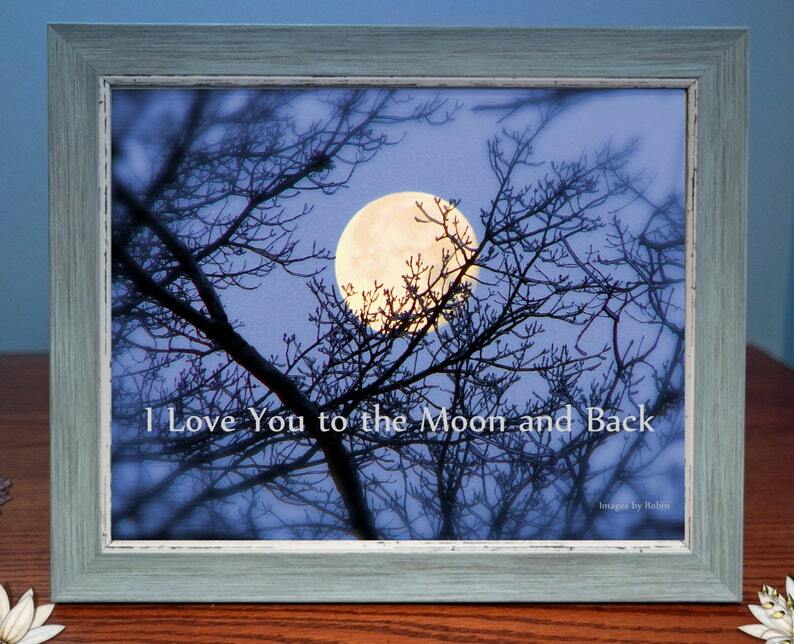 Digital Photo Gifts - I Love You To The Moon and Back framed photo gift that can be personalized with a special message also! Customize with a personal message or purchase as is. A stunning photo of the moon taken by Robin's Images and design by Vicki D.
We offer both 5 x 7 and 8 x 10 photo sizes with frame. A high quality blue distressed looking frame with black velvet backing that can stand alone or be hung. If you would like to have a message added directly onto this photo please click on the custom request icon and let us know what you would like us to add. Please add a good contact number also should we have any questions. If this is a gift for someone and you would like us to add a hand written note to accompany it we are happy to do so. Again, please let us know what your note should read by clicking onto the custom request icon. Our digital photo gifts are professionally printed. Thank you for stopping by and we will take great care creating your gift!